Today I combined two trail segments, by walking a large rectangle that spanned Hercules and Pinole. Actually, the shape of the route I covered was probably closer to a large squiggle. 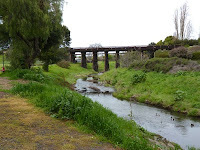 I enjoyed walking through historic Pinole. There were several possible meal stops here. I paused for lunch at Sam's doghouse, a family run business, where I was able to buy a Fritos boat to go with my hot dog. 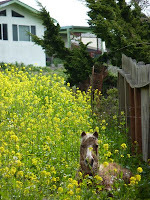 In amongst several historic houses, I was surprised to see a horse almost hidden in some yellow flowers, behind a fence. I'm sure the horse wasn't used to seeing many pedestrians either. After lunch, I turned around and headed back, Northeast on San Pablo Ave. for a few short blocks. 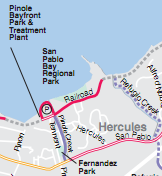 Then I turned right to follow the Pinole Creek Trail (purple line on map), through a park, under a large wooden bridge, and toward the Bay and the railroad tracks near Bayfront Park. I then turned Right onto the Bay Trail (solid red line) toward Railroad Avenue (retracing steps from previous walk). I don't always stick exactly to the Bay Trail. 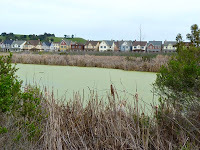 I sometimes explore new bay-side developments in an area. 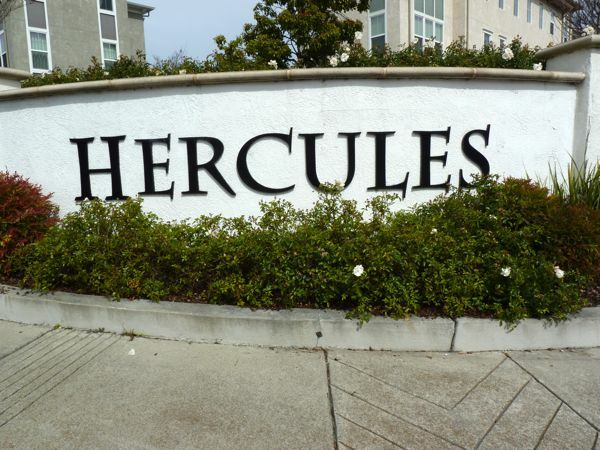 In Hercules, there are fairly dense housing tracts going in, south of an industrial park at the end of John Muir Parkway. The remnants of old company buildings (housing?) that were associated with manufacturing dynamite and gunpowder appeared to be boarded up or long gone. 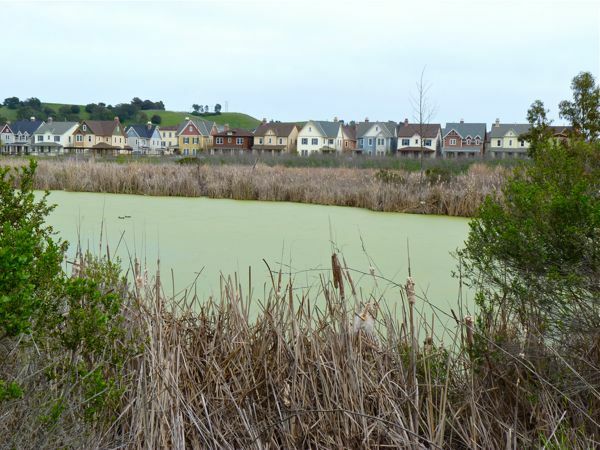 The new community looks like it has been very carefully planned. A few small businesses are incorporated into the ground floors of multi-story buildings. My wanderings through this newly developed area took me along Sycamore, Bayfront, and Tsushima (and a few other streets shown in white, or not shown, on Bay Trail map) to return to San Pablo Ave. Much of this new development was private property, and there was a large tract closest to the Bay which looked like it had yet to be developed. But, parts of this area were somewhat pedestrian friendly.